Do you want to know which platform is more convenient for the forms of your company? If you are thinking about abolishing paper forms in your company to be more efficient and not waste time, digital platforms are the best option for you. 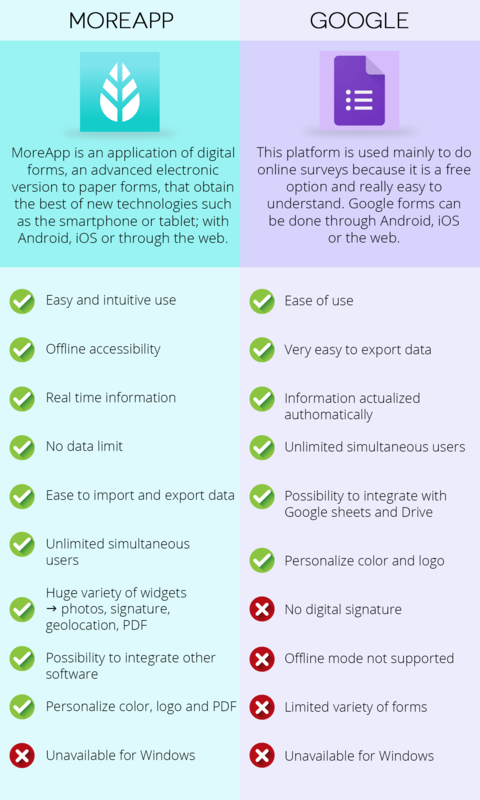 Therefore, here you have a comparison between google forms and digital forms. Digital platforms provide companies the possibility of organizing their forms in a simplest way. Taking into account the fact that a lot of companies want to eliminate the obsolete paper forms since they are costly both for the company and the environment, the best option is to go into digital forms. These kind of forms are really easy to use and allow the company to obtain data in a faster way. However, there are a lot of available platforms and it is normal that doubts about which platform fits better in the company arise. Therefore, in this blog you can find a little comparison between two of these platforms: Google forms and MoreApp digital forms. To sum up, if you prefer to do surveys with an online platform being able to export data to google sheets without the possibility of personalizing the PDF, the best option will be google forms. On the other side, if your company needs work orders, checklists, surveys, etc. and you need to work with offline forms where the information is modified in real time, the best will be a platform of digital forms such as MoreApp. Don't wait and create a free account now!